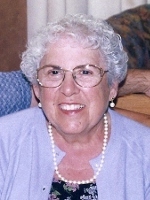 ALBANY – Helen M. Triolo Mirabile, 86, of Albany, died peacefully Tuesday, December 7, 2010 after a long illness while surrounded by her loving family at her home. Born in Albany on April 16, 1924 to the late Santo and Carmela Triolo, she was a lifelong resident of Albany. She was a graduate of Vincentian Institute, class of 1941, and worked in the claims department of Preferred Accident Insurance Co. for several years, and then at the Internal Revenue Service as an examiner. She then transferred to the VA Hospital where she served as a Ward Secretary and secretary trainer. After her marriage to Anthony Mirabile in 1953, she left the VA Hospital to raise a family. She was later employed by Lake Electronic Service as a Warranty Administrator and Corporate Secretary. She served as a board member of the Italian American Community Center and worked on many committees. She was a communicant of St. Margaret Mary’s Church where she served as Secretary and President of the Senior Citizens Group. She also enjoyed watching Yankees baseball. Mrs. Mirabile is survived by her husband Anthony J. Mirabile; her children Andrew Mirabile, Joanne DiFrancesco (Robert), Julie Miller (Louis), and Joseph Mirabile; her grandchildren Jennifer Biski (Joseph), Gregory and Nicholas Miller, and Nicole and Sarah DiFrancesco; her sisters Vera Rappazzo, Sarina Nagi, and Cecilia Rigosu (Vincent); her brother Joseph Triolo (Ann); and by many nieces and nephews. She was predeceased by her brother Vincent Triolo. The family wishes to thank Juanita, Floris and Lisa Peters for the dedication and wonderful care they provided Helen during her illness, and to Community Hospice, most particularly Nina Lake for her compassion and care at this difficult time. Funeral services will be held in the Hans Funeral Home, 1088 Western Ave., Albany, Friday morning at 8:45, and from there to All Saints Catholic Church (formerly St. Margaret Mary’s Church), Homestead St., Albany at 9:30. Relatives and friends are invited, and may call at the funeral home Thursday from 4-8 p.m. Interment will be in St. Agnes Cemetery, Menands. In lieu of flowers, the family requests donations in Helen’s memory to All Saints Catholic Church, 1168 Western Avenue, Albany, NY 12203; or the Alzheimer’s Association, Northeastern New York Chapter, Pine West Plaza, Bldg 4, Suite 405, Washington Ave Ext, Albany, New York 12205-5515. To leave a message of condolence for the family, view or print a prayer card, or obtain directions to the funeral home please visit www.HansFuneralHome.com. Our deepest sympathy to the family. May she rest in peace. To the family of Helen Mirabile – I extend my condolences to all of you, especially Anthony. For many years growing up, we were neighbors and what wonderful neighbors they were. Helen was always a bright, friendly warm part of every day. I shall miss knowing she is not here, but I’m certain she is happy – and I imagine you have wonderful wonderful memories of her as a mother and grandmother and wife. I am so sorry to read of the passing of your mom. My thoughts and prayers are with you at this most difficult time. She was a wonderful lady and surely will be missed.